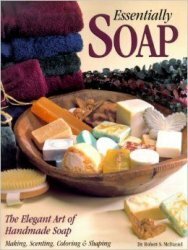 "The Elegant Art of Handmade Soap "
Essentially Soap was written from the experience of a Chemist who worked in the soap and detergent industry for twenty years. "Dr. Bob" as he is known on the internet soap lists, gives detailed discussions of rebatched, cold process, and melt and pour soapmaking techniques. Additional topics include the selection and use of natural and "unnatural" colorants, the use of essential oils, and how to compose a fragrance symphony blending fragrance "notes" to make a unique and pleasing bouquet. There are over 140 beautiful full color photographs illustrating the techniques and results plus over 30 recipes taken from Dr. Bob's own line of soaps. And for those unexpected problems confronting soapmakers, Dr. Bob has aprinkled the answers to the most frequently asked questions throughout the book.